For researchers who specifically want to study exosomal RNA or proteins, removing non-exosomal molecules prior to treatment with ExoQuick® can lead to data that more reliably reports on exosomal RNA or proteins. Because both high density and low density lipoproteins (HDLs and LDLs) can contain miRNAs1, lipoprotein removal is recommended prior to exosome isolation from serum or plasma. ExoQuick-LP® is specifically designed to remove normally-occurring lipoprotein particles from serum or plasma prior to ExoQuick precipitation of exosomes. The ExoQuick-LP Kit contains ExoQuick and proprietary pre-clearing reagents that efficiently deplete lipoprotein particles from plasma or serum prior to ExoQuick treatment. Vickers KC, et al. MicroRNAs are transported in plasma and delivered to recipient cells by high-density lipoproteins. Nat Cell Biol. 2011 Apr;13(4):423-33. With ExoQuick-LP, up to 90% depletion of lipoprotein particles from serum or plasma can be achieved. SBI’s exosome isolation products help you take full advantage of the power of exosomes. 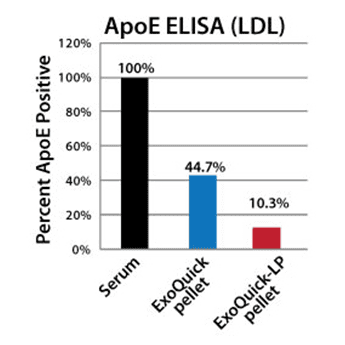 ExoQuick-LP treatment of serum results in lower amounts of lipoprotein markers (ApoA-1 for HDLs, and ApoE for LDLs) that co-isolate with exosomes than treatment of serum with ExoQuick alone, as shown by ELISA (Figure 1). Figure 1. ExoQuick-LP efficiently clears lipoproteins from serum. To test for exosome recovery after ExoQuick-LP pre-clearance, we used SBI’s Exosome ELISA kits (Cat.# EXOEL-CD81A-1, EXOEL-CD63A-1, and EXOEL-CD9A-1) to measure the approximate number of exosomal particles present in ExoQuick serum pellets with or without treatment with ExoQuick-LP (Figure 2). While there were some differences in observed particle numbers in untreated vs treated samples, overall yields were quite similar, suggesting minimal loss of material using ExoQuick-LP. Figure 2. ExoQuick-LP delivers robust exosome yields. Serum exosomes pre-treated with ExoQuick-LP were also tested for size and concentration using NanoSight tracking analysis with a 1:100 dilution of isolated exosomes (Figure 3). We observed that there are minimal differences in particle sizes using ExoQuick-LP vs untreated controls, suggesting that exosomes are intact and structurally similar to exosomes isolated using standard ExoQuick isolation methods. Figure 3. ExoQuick-LP delivers particles of the size expected for exosomes.